The trailer Raarandi Veduka Choodham starring Naga Chaitanya and Rakul Preet Singh was released a few days back. The video has thus far clocked 2.6 million views on YouTube and has garnered some positive response from the audience. Nagarjuna production banner, Annapurna Studios is producing this romantic love story. Nagarjuna took to his Twitter space to thank everyone for the response for the trailer. 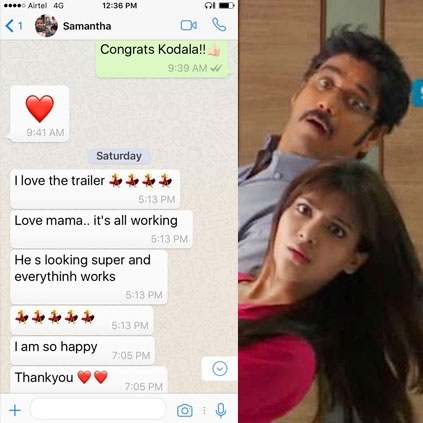 He also shared a screenshot of his chat with Samantha which is going viral in social forums since yesterday. We attach the chat along with this story. People looking for online information on Nagarjuna, Samantha will find this news story useful.